This is a question that many students ask after completing their undergraduate degree, unsure of whether grad school is really the best way to help them achieve their career goals. Both the cost in tuition fees and the extra length of time out of employment can mean that applying to graduate school is a decision not to be made lightly. For this reason, it is essential that your overriding reasons to go to grad school are firmly founded. Below is a list of 10 of the most common reasons to go to grad school, which, depending on your field and mindset, should help you decide whether applying to graduate school is the best next step for you. Although it’s not strictly necessary to have a firm view of your future career before applying to graduate school, it certainly helps. This is because grad school often acts as the academic version of professional training, enabling students to graduate with all the right knowledge in all the right places, ready to jump straight into their desired careers. Either way, students applying to graduate school should do so with their eyes on the future, seeing further study as an investment in their own potential and not simply as a way to postpone the end of student life. More people than ever are attending graduate school today, and because of this an undergraduate degree alone can sometimes fail to get you noticed alongside equally or more highly qualified candidates. With university education in contemporary society increasingly viewed as more of a rite of passage than a luxury, and 11% of the workforce (in the UK) now holding a graduate degree, bachelor degree holders are struggling to appeal to employers even at entry level in certain industries – especially when up against candidates with PhDs. 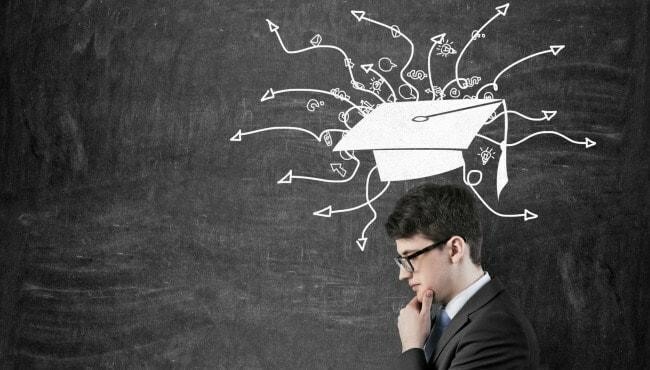 Whereas much of the worth of an undergraduate degree is in the qualification itself, the most important reasons to go to grad school may be more for the professional skills you’ll gain, the personal development you’ll undergo and the valuable connections you’ll make with fellow graduate students, academics and industry experts. It’s frequently said that grad school is about much more than obtaining a few letters behind your name and a fancy piece of paper; it’s about developing yourself professionally so that you’re ready to enter the world of work. If you act smart in grad school, by the time you graduate you’ll have built yourself a professional landing mat of contacts and relationships, which will serve to keep you in the field and, ultimately, employed. Although most undergraduate degrees allow students the opportunity to study modules and classes of personal interest, a graduate degree does this to a much greater extent. In order to get the most out of your graduate degree, you will be expected to conduct personal research alongside set study topics, in order to develop your thoughts and ideas regarding something that deeply interests you. Attending extracurricular activities and meetings, hearing from guest speakers and lecturers as well as full-time faculty members you find interesting, is what makes grad school so diverse and multidisciplinary. For students with passionate academic interests then, the answer to the question “why go to graduate school?” is obvious! Grad school is different to undergraduate studies in a number of ways. One difference is that while undergraduate level student life is widely associated with socializing, sleeping late and cramming alone in the library, grad school is much more about connecting with people professionally – not just fellow graduate students but faculty members too. So while you may have locked yourself away in the darkest corner of the campus library during your years as an undergraduate, as a graduate degree student you’ll need to learn how to network like a pro by honing your ‘people skills’. If that sounds scary, remember that networking doesn’t have to be a dirty word; networking is your friend! In the professional world, networking is something many of us must do to get our feet in the door, and simply means you’ll be connecting with like-minded people within a professional context in order to collaborate, discuss and further your own knowledge, skills and professional circle. Not only will you be making professional connections, as a graduate student you’ll be making good friendships as well. The very nature of graduate school makes finding friends who are motivated, focused and mature just that little bit easier; your grad school friends could be the ones you end up sticking to for longest. Bettered financial prospects is a popular answer to the question “Why go to graduate school?” – though it may not necessarily be the most important factor. Even so, a graduate degree has been found to improve the financial prospects of UK workers by over UK£5,000 (US$8,200) more each year, compared to someone holding just a bachelor’s degree. Although this may not seem like a life-changing amount, the additional money accumulated in a working lifetime works out at around UK£200,000 (US$328,700). And that’s just the extra! Grad school provides a stable forum to research and explore theories and ideas. If during your degree you conduct any research that is particularly exceptional, the chances are you’ll be recognized for that achievement by the academic community – perhaps by being invited to present your paper at a conference, contribute to a research project, and even receive accreditation in a piece of work published in a journal. International recognition is also a prospect for those who continue their research after graduation, and one day, who knows, you may well become a prominent expert in your field. At grad school you’ll be surrounded by leading thinkers in your field – including both the faculty members and guest experts at the front of the lecture hall, and the fellow graduate students around you. When working with people we’re inspired by and look up to, staying motivated and working hard is much, much easier. In addition to all these talented people, you should also have access to excellent material resources, potentially including the latest technologies and high-end equipment being used within your field, such as spectral imaging scanners or nanotechnology systems.